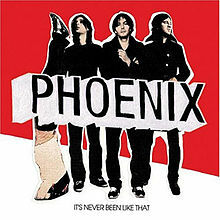 It’s Never Been Like That is the third studio album by French alternative rock band Phoenix. It was released 15 May 2006 in the European Union. The album was preceded by the release of the single “Long Distance Call” on 8 May 2006 (see 2006 in British music and 2006 in music). The album was later re-released in Mexico as a Tour Edition with four bonus tracks recorded live in Oslo the 20th April 2006. It’s Never Been Like That was rated #13 in Pitchfork’s Top 50 Albums of 2006 and #38 in their Top Albums of the 2000s. The album has sold 36,000 copies in the United States according to Nielsen SoundScan.